It always amazes me how you flush out even the smallest details. The folds in the plastic bag are wonderful and I love seeing the eggs just peeking through. Excellent! Your sketches are fantastic and such a nice way for us to glimpse into daily life in Hong Kong. 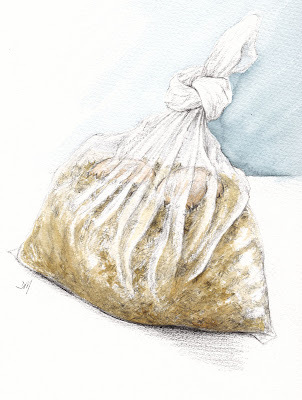 It is funny using google reader because I read your answer, with fab bag sketches, before I saw the drawing of eggs in Camembert box, which is quite amazing for its details. I LOVE the story behind this. You made me laugh. This drawing is so stunning, that I just had to leave your flickr photostream, and come immediately to your blog, to let you know. It's absolutely gorgeous. The detail, the colors, everything. Bravo, you talented thing, you! These are beautiful drawings, and the ones below. I loved the story that goes with your quail eggs. I have never seen quail eggs in real life but the do look lovely here. Debra! Excellent answers to my questions. Thank you. I love your bag of eggs. Your drawing is so delicate and I love the folds of the bag. I don't think I've ever had a quail egg. I guess I didn't realize they were so small. Absolutely fabulous and somehow I had missed your Quail eggs post so this was very interesting too!